Snickers 3257 flame retardant trousers incorporate advanced cut with twisted leg design. Gusset in crotch for outstanding working comfort. Cordura reinforcements for the knees and inside the holster pockets for extra durability. For superior knee protection comes with Kneepad pockets designed for the KneeGuard positioning system. Easy-to-access leg cargo pocket with mobile phone compartment with four pen/tool compartments. Antiflame work holster trousers designed to protect on contact with flame, convective or radiated heat. Snickers Workwear 3257 Trouser Material: 100% Flame retardant cotton, 290 g/m2. The material is soft, unlike other anti-flame fabrics that often feature heavy, uncomfortable treated material. Anti-flame garments fulfil the relevant safety standards set out in EN11612. Snickers Workwear 3257 Flame Retardant Trouser conform to: EN 11612, EN 11611 and EN 1149-5 safety clothing standards. Mascot Bex protective trousers are a top quality pair of work trousers. Face-down seams prevent sparks and molten metal lodging in crevices. Protects against electric arcs and occasional welding arcs. 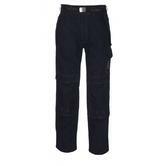 Anti-static, acid resistant and flame retardant, make these trousers soft and comfortable to wear. EN ISO 11612 (A,B1,C1,E1) for protection against heat and flame. EN ISO 14116 (Index 3, 50 x 75C) for clothing with limited flame spread. EN 61482-1-2 (Class 1) for protection against the thermal hazards of an electric arc. EN 1149-3 and EN 1149-5 for protection against static build up. EN ISO 11611 for protection of workers engaged in welding and allied processes. EN 13034 for protection against liquid chemicals. 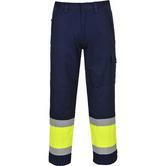 Wenaas Offshore Daletec 350gsm Antistatic Trouser are designed specifically for offshore industrial work. Trouser has been manufactured with 99% cotton, 1% antistatic fiber fabric. The Daletec fabric is inherently FR - so unlike other flame retardant products, these trousers will retain their protective qualities for longer. These antistatic Offshore trousers will protect against heat, flames and electric arcs. Secure a sturdy zip fly fastening and waistband features handy belt loop. The Wenaas Offshore Daletec 350gsm Antistatic Trouser comes with two front pockets, two more at the rear which are secured with flaps. Excellent Wenaas Offshore trousers come with kneepad pockets, and both legs feature Hi-Vis reflective bands. It is a stylish and practical garment with knee pad pockets, rule pocket, rear patch pocket, leg pocket and triple stitching on the seams. Made using Modflame, 60% Modacrylic, 39% Cotton and 1% Carbon Fibre. Strong flexible microflex bib & brace trousers with elasticated shoulder straps, high frequency welded seams and adjustable press studs on ankles. Microflex PolyUrethane coated - meaning is is soft, silent, stretchable. Elasticated shoulder straps with buckles. Press stud adjustment at ankles. This trousers provide great thermal insulation, are fully waterproof and windproof while ensuring breathability. 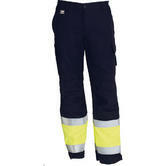 Wenaas FR Multinorm workpants offer resistance to flames, high visibility and antistatic properties. Flame retardant and high visibility trousers with Slash pockets in the side, and back pockets, one with flap. Folding-rule pocket with pen pocket amd leg pocket with phone pocket and flap. Quality fabric: 54% modacrylic, 44% cotton, 2% antistatic fibre, 280 g.
Wenaas FR Multinorm Trousers conforms to: EN11612, EN11611, EN1149-5, EN471 Class 1, EN13034 Type PB , EN61482-1-2 standards. Roots Full Option FR Dungarees RO1527 Hi Vis Yellow/Navy Two-tone. Fluorescent Dungarees includes reflective bands. Taped seams enhancing the users comfort. Adjustable shoulder straps with short strong elastic and plastic buckles. Shell: Waterproof Full Option; 99% Polyester / 1% Antistatic + PU film; 250 g / m2. Lining: Flame Buster liner; 100% cotton; 185 g / m2. Roots Full Option FR Dungarees RO1527 Hi Vis Bib & Brace conforms to: EN ISO 13688:2013, EN 1149-5:2008, EN ISO 14116:2008 Index 3/50H/40, EN 13034:2005 + A1:2009 Type 6, EN 343:2003 + A1:2007 3/3, EN ISO 20471:2013 Class 2 standards. This lightweight, breathable bib & brace is the ideal outer layer in whenever you are facing rain, low visibility or flame related hazard. The Portwest Ignis Lined Approach Trousers are a heat reflecting garment designed for use in environments with high heat and fire hazards occur. It has multi layer protection and its metallised aluminium coated outer layer helps deflect and disperse heat. This aluminium trouser has an elasticated waist for a tight fit, ergonomic knees for ease of movement. Elasticated adjustable braces and a back bib for support. Complies to EN11612 A1. B2. C3 safety standards. 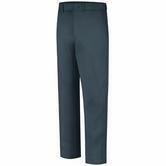 The Sioen Greeley Trousers are 100% waterpoof, flame retardant & antistatic. These are highly used as overtrousers in many industries, especially the offshore and oil & gas industry. It is ideal for multiple working environments. The taped seams and reflective tape mean it can also be worn in extreme weather conditions. It includes a back bib for added protection, a flame resistant cotton lining and a concealed zip in outer leg. These are INHERENTLY flame resistant Nomex work trousers. Comfortable work trousers comes with Back pockets. On the right Leg Cargo pocket with Velcro closure flap. Wenaas Sofileta Kansas Trousers 20057-0-45 are made using 93% Nomex III, 5% Kevlar, 2% Antistatic carbon metal P140 fabric. Wenaas Kansas Nomex FR Work Trousers certified to EN 531 A, B1, C1; EN 11612 A1, B1, C1 and EN 1149-3 Safety Standards. This trouser is constructed with high visibility reflective tape double stitched for enhanced durability. Fabric: Bizflame Plus - 99% Cotton and 1% Carbon fibres 350g/m². The Orbit Hellas Flame Retardant trousers are made from genuine fabric. FR trousers provide flame retardant action to ensure extra protection in case of fire. Tough, strong and durable, these trousers include swing pockets, zip and button fastening system. Fabric: 100% FR Treated Cotton 320g/m². Orbit Hellas Red FR Trousers conform to: EN ISO 11612: 2008 (A1, B1, C1,) EN ISO 11611: 2007 Class 1 A1 EN 1149-5: 2008 safety standards. Multi-norm workpants will keep you dry and comfortable, offer resistance to flames and give extra safety thanks to the reflective FR strips. Leg narrowing below by touch and close fastening. Fabric: 100% polyester fabric with 100% FR PU coating 250 g/m². EN 343 : 2003 + A1 : 2007 / Class 3-3. Your safety matters to us at North Sea Workwear. We want our garments to protect you from heat, skin burns and naked flame risks in your workplace. Our range of over 20 different styles of anti-flame or flame resistant (FR) trousers comes from the best brands, including Lyngsoe (waterproofs), Mascot (cotton FR), Portwest (Bizweld), Snickers, Tranemo (great fit and quality) and Wenaas. They all comply with the relevant EN ISO 11612 (FR standard); some also have the EN 11611 (welding standard) or EN1149 (antistatic standard). 2) Do you need hi vis trousers? The Sioen Greeley hi vis overtrousers keep you visible and dry. 3) Do you need chest protection? 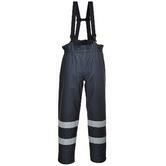 eg dungarees or bib and brace Fr garments, such as the Roots FR hi vis dungarees trousers. 4) Do you want Inherently FR trousers? - ie trousers that are permanently FR? (most garments are FR treated cotton - which igives you FR protection for about 50 washes - which is usually the life of the garment). We offer modacrylic FR trousers which are permanently or inherently flame retardant - no matter how many washes. Eg the Portwest Modaflame trousers in navy and yellow two tone. Because we stock quality brands this helps ensure that you are protected should disaster strike in your workplace. 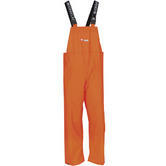 We also offer FR coveralls or separate FR jackets and pants to suit your needs. Call us today or visit our Offshore workwear section of this site to see more of our range of fire retardant clothing.